This is an extremely refined example of a gold-leaf tributary document from Siam (present-day Thailand). Known as a “piao” in Chinese, it refers to documents written by foreign vassal leaders to the Ch’ing dynasty emperor. Whether the Siamese king actually submitted to this condescending relationship, however, needs to be deciphered from the contents of the document. According to the record of tribute from the Siamese king Taksin (Chinese name Cheng Chao) in the National Palace Museum collection, Taksin dispatched an envoy to submit tribute on the 26th day of the fifth lunar month of 1781. 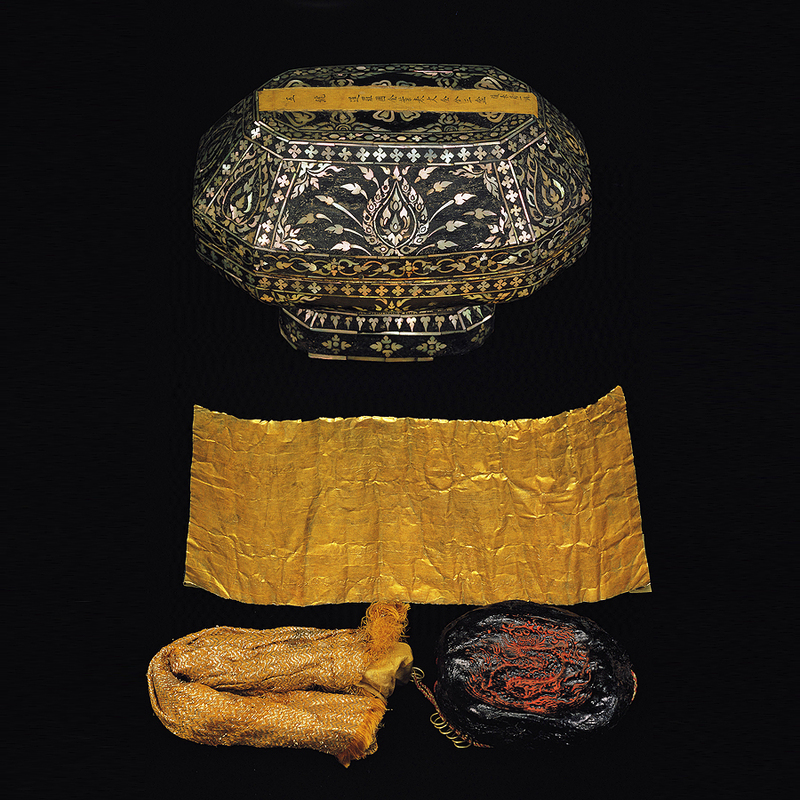 The tribute included a gold-leaf tributary document, a male and female elephant as well as assorted exotic luxury items as incense, peacock feathers, ivory, rhinoceros horn, camphor, ebony, cinnamon, and fragrant wood. Among the more precious items in the tribute were the elephants and large quantities of rhinoceros horn, ivory, tin, rattan, pepper, and sappanwood. Fearing that these would exceed the conventions for tributary offerings, they were not included in the main list. It is generally believed that this gold-leaf document was from the great Thai leader Taksin himself, who became king of Siam after repelling invading armies of Burma. Early in his reign, in order to gain recognition for his leadership and consolidate his political status, he exchanged generous gifts for title. According to records from the “Archives of Handiwork” in the Imperial Household Department, the Ch’ing court often melted down gold-leaf documents for other uses, so very few of them have survived. This example in the National Palace Museum collection is thus quite precious and rare.